Albania, on South Eastern Europe’s Balkan Peninsula, is a small country with Adriatic and Ionian coastlines and has an interior crossed by the Albanian Alps. The country has many castles and archaeological sites. Capital Tirana centres on sprawling Skanderbeg Square, site of the National History Museum, with exhibits spanning antiquity to post-communism and frescoed Et’hem Bey Mosque. 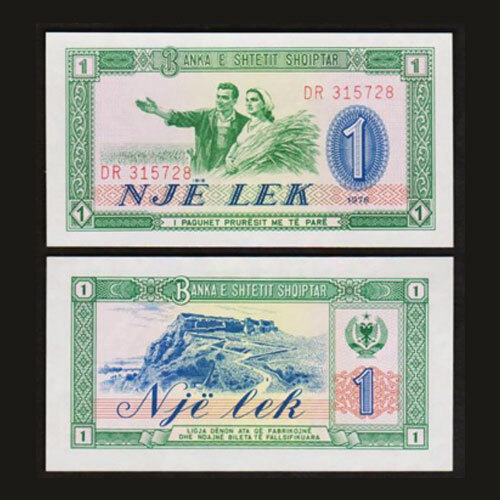 The Lek is the official currency of Albania. It is subdivided into 100 qindarka, although the qindarka are no longer issued. The lek was introduced as the first Albanian currency in February 1926. In 1926, the National Bank of Albania (Banka Kombetare e Shqipnis) introduced notes in denominations of 1, 5, 20 and 100 franka ari. In 1939, notes were issued denominated as 5 and 20 franga. These were followed in 1944 with notes for 2, 5 and 10 lek and 100 franga. The note depicted alongside is a 1 Lek banknote issued in 1976. The front portrays an Albanian peasant woman with sheaf of wheat and a mechanic. The back depicts Rozafa Castle of Shkoder (Shkodra) on a hilltop, Coat of arms, along with the Watermark: Bank logo seal pattern - Star & B.SH.SH.